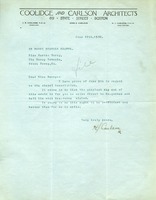 Emily V. Hammond writes to Martha Berry to tell her about a large event she had to raise money for the Berry Schools. 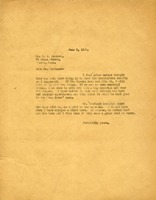 Dr. Leonard spoke at the event and they read a letter from Berry. They have pledges for $37,775 to go toward building Pilgrim Hall. 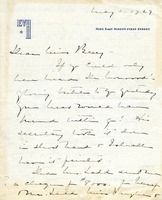 Harry J. Carlson advises that Martha Berry write to Mr. Carman on the matter of the chapel inscription. 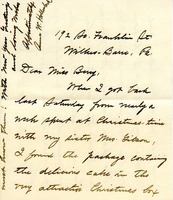 Martha Berry writes that she wishes to have the inscription in the chapel use just Mrs. James' name. A recent visit by Robert B. Cridland was most enjoyable.